The system uses RTK DGNSS to calculate highly accurate positions (GNSS = Global Navigation Satellite System, e.g. GPS). DGNSS stands for Differential GNSS and means that a reference station uses its known position to calculate the current deviation of the GNSS signal. This difference value is then transmitted wirelessly to all rovers (usually cranes). To make the position even more accurate Real Time Kinematic (RTK) is applied. Here the carrier phase of the satellite signal is evaluated (the system needs up to approx. 60 seconds after initial start up for ruling out ambiguities). RTK DGNSS gives an accuracy of about ±2 cm which enables Container Tracking and RTG Autosteering. Using the system RTGs can detect and wirelessly transmit the current position whenever they pick up or set down a container. The superordinate container management system can then check the position and store it, thus documenting the whereabouts of individual containers. Due to the high accuracy of the system it is possible to track a vehicle‘s movements. Consequently by using a series of measurements together with the geographical positional data it is possible to determine the vehicle‘s direction and its velocity. 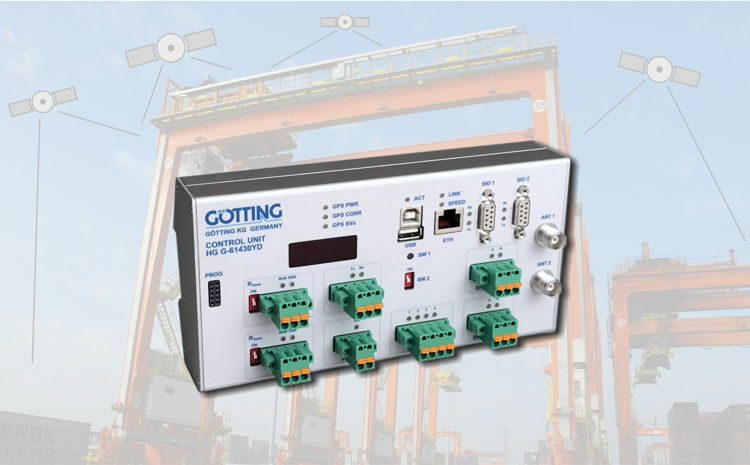 With the help of these functions it is possible to automatically steer a RTG over a predetermined route within a container yard. This means that apart from the free movability that rubber tired vehicles provide, they can also be used like rail mounted vehicles. A special advantage of the system is that for both functions there is no need to mount equipment within the track surface of the container yard.